EQP-1A, Software parametric EQ from Universal Audio in the UAD Plug-In series. As always, make sure that you've got the right version software that is compatible with your OS and whatever recording/audio software that you've got and your installation should be golden! The EQP-1A is fairly self explanitory, so you should have no difficulty becoming familiar with it. I've been using the EQP-1A for about 7 years and I have to say that the EQP-1A and it brothers, the MEQ-5 and the EQH, are simply some of the best emulated hardware plug-ins that you could possibly buy. Performance and Compatability-wise you shouldn't have any problems. This family of EQ's are very minimal CPU hogs and can really be essential in your arsenal once you become comfortable with them. The EQP-1A really shines when used as a plug-in in a mastering session. The 'P' in EQP stands for program. It should be inferred that that implies that it's intended use is for material that is already "mixed". Of course, that shouldn't scare you away from trying this guy out on other things. Just try this plug-in on an overhead track sometime.However, I strongly suggest that you employ this plug-in in your mastering sessions. That is what it was designed for, trust me you will love it. Strangely, the EQP-1A, and it's counterparts, behaves differently depending on the source input. For example, if you throw something with REALLY prominent high end, then the treble section of the plug-in will respond differently than it would if you input something REALLY bass-heavy. The opposite is true as well. Another odd fact about the EQP-1A, is this: The low end boost and cut knobs can actually be used simultaniously. You may initially think, "OK, so I can boost or cut some frequency in the low end, no big deal." You would be correct, but, if use boost and cut together, and this means simultaniously boosting and cutting the same frequency, what ends up happening is that you can alter the phase relationship of that particular range of frequencies. It may sound strange but, try using that technique to really tighten up a bassline and kick drum during mastering. I promise that the results will tell the tale. 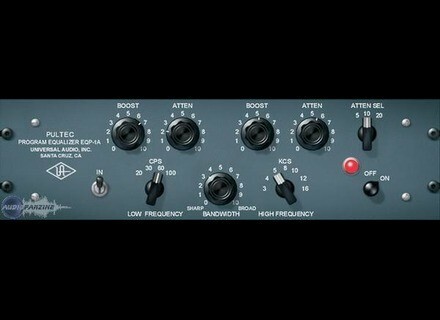 Yet again, strangely, the high end sction of this EQ does not operate on the same principle. It does however, regardless of the "Q" knob setting, have a slightly different "Q" between the boost and cut settings. You may have a 5K cut and a 5K boost but the phase relationship will remain unaffecred, but the difference in "Q" width will alter the sound in unusual and quite often pleasing ways. If you really want to get the most out of this plug-in, do yourself a favor and purchase a good real-time spectrum analyzer so that you can SEE just how subtle and incredibly awesome the EQP-1A really is. The EQP-1A is an absolute must have if you are creating your own masters. It's versatility when used on other, single instruments(specifically strings), is amazing. You really cannot go wrong by buying the EQP-1A. loudfunk's review"Another lovely U-Audio EQ..."
The Pultec EQP-1A Program Equalizer and Pultec MEQ-5 plug-ins are faithful electronic reproductions of the classic hardware equalizers. Our DSP wizards have ensured that every revered sonic nuance of these vintage processors are faithfully maintained. In designing the Pultec equalizer plug-ins, we performed detailed analyses of the signal path and equalization characteristics of selected well-maintained, in-spec Pultec equalizers used regularly in professional studios. A “golden unit” was selected, and the resulting model reproduces the measured equal- ization and signal path characteristics to within a fraction of a dB mean error for all knob settings. All of the unique features of the original Pultec EQ’s are included in the plug- ins, including the separate boost and attenuation controls, the smooth, sweet top end, and the ability to dial in seemingly dangerous amounts of boost with- out getting into trouble. All front panel controls are included, and all of the knob tapers are accurately modeled. The Pultec has long been a choice of re- cording and mastering engineers for its ability to bring out individual fre- quency ranges without significantly altering other frequencies. In addition, the Pultec is one of those magical pieces of gear that makes audio program sound better just by passing through it. The sophisticated modeling technol- ogy used in the Pultec plug-ins captures both of these key attributes. The EQP-1A can control three frequency ranges simultaneously, using three groups of interacting parameters. The first group controls the low frequencies and has three controls: boost, at- tenuation, and frequency select. The second group controls the high frequen- cies and has three controls: boost, bandwidth, and frequency select. The third group also controls the highs and has two controls: attenuation amount and frequency select. i'an's review (This content has been automatically translated from French)" good one"
Polling opens the spectrum. Super plug. The Pultec has attracted a package producer, for its quality crude, and its function. It is obvious .. Avoid boosting beyond 3 / 4, is already to go. is not neve .. I do not t trssduit by this plug. I'm counting on making a DIY, but first wanted to buy this card to get an ide of priph HARDWARE, either level or compressor qualiseur. J'espre, and I think that the harware versions are better quality. Well, it is relative, this plug is given with the card and the Pro version is better. I do never use it this plug, which seems to give an effect "box" that passes through otut. Unless I do not know to use it (possible, even if Eq Soundscape sound much better in my hands at least ...).